Great communities are intentional, not accidental. You may be one of those special people among us who wants to build communities in a very intentional and life-changing way. Maybe even make a career of it. If so, welcome. The Nelson and Sue Andrews Institute for Civic Leadership was founded in response to the reality that addressing community challenges today requires very different skills than those employed by previous generations of leaders. As we like to say, great communities are not accidental, but intentional. Here you will learn to intentionally, agilely and successfully create change. The Nelson and Sue Andrews Institute for Civic Leadership was launched in October 2010 for the study and practice of collaborative leadership - the creative civic solutions that result when business, nonprofit and government work together for the common good. While great academics are an important part of the Andrews Institute, our real heart lies in community engagement and a dedication to educating and inspiring others to follow Nelson and Sue Andrews’ example of collaborative civic leadership. 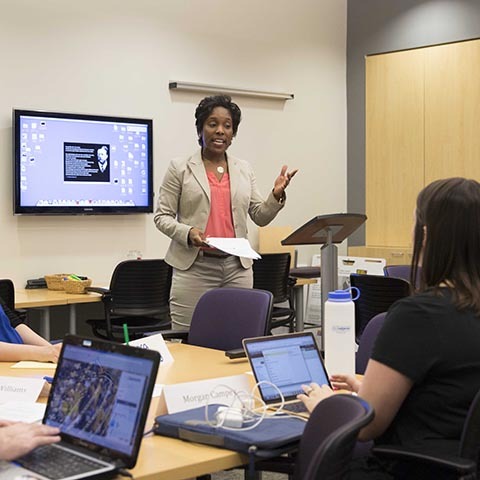 Through our citizen leadership academies, the institute develops individuals to lead the public conversation on community issues and public policy in collaboration with government, business, education and not-for-profit leaders. Together, we are working to build thriving communities. Cable Executive Leadership Academy Music City Girls Lead!